Why go with custom skis? Are handcrafted skis really better? If you allow the experts at Praxis to handcraft your next pair of skis you will find the answers to these questions. Or simply keep reading for more information on the benefits of custom skis. The idea of “custom skis” has progressed wildly in recent years. 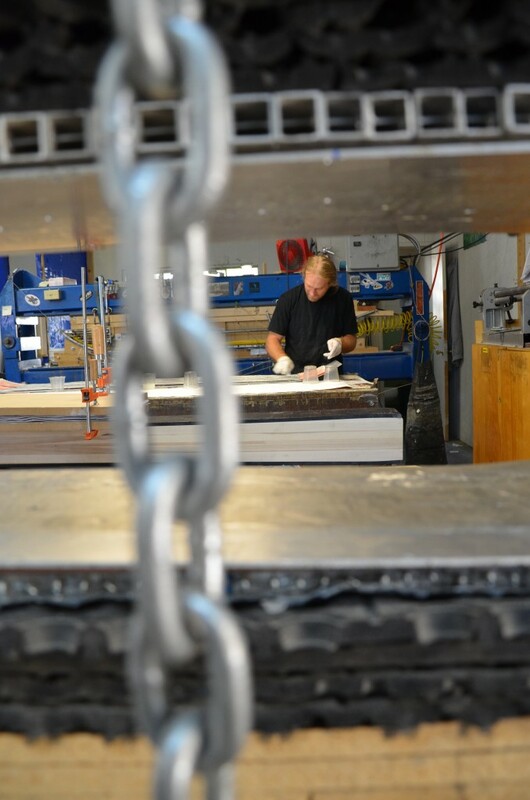 Being on the forefront, we developed Praxis and our first ski production facility over a dozen years ago. We were simply freeskiers with an overwhelming drive and passion to evolve our sport of skiing. Considering the rich and long history of skiing, that seems like a bold statement. But, at that time the term custom skis barely existed, and the ski industry was ruled by a monopoly of only a few large brands. These mainstream brands were running their stock products through a brainwashed system of reps and brick and mortar ski shops. The “freeskier” didn’t have a voice. As freeskiers of the time we were not happy with the skis we could purchase and the movement was set in place for change. Step forward ten years and the ski industry has flipped full circle. Now we are looking at an industry flooded with independent ski builders. Some days it seems every ski bum with a garage is cranking out their own brew of boutique skis. The freeskiing movement has been enlightened with a new confidence. Skiers no longer look to large corporate owned brands for the next best ski, nor do they swallow up the BS that some marketing firm sticks to that ski. Skiers now have a new understanding of the shapes, sidecuts, materials, flex, and construction of what’s on their feet. Probably a good thing considering we are all sliding down some ridiculously steep and sketchy mountains on them. It is this new understanding of ski design, materials and construction that has brought an appreciation to the benefits of custom skis. Praxis Custom Skis are tailor made to fit you personally. We are not only letting you stick some pretty graphic on our already manufactured ski. No, we work with the skier to modify our skis to be a better fit for you personally. It starts by selecting one our pre defined, tested and proven ski shapes, and from there you can modify that ski build to fit your needs. What’s your height and weight? Skiing ability? What regions and resorts do you ski at? How often do you ski? What aspects of the mountain do you seek out? Will this be a touring ski or a resort ski? Maybe you like to go fast, maybe you like to make a lot of turns, or maybe you hide out in the trees. This is the kind of info we want from you to help us create the best custom ski for your needs. We are readily available and eager to have a conversation with you to help determine what custom options are best for your next pair of skis. 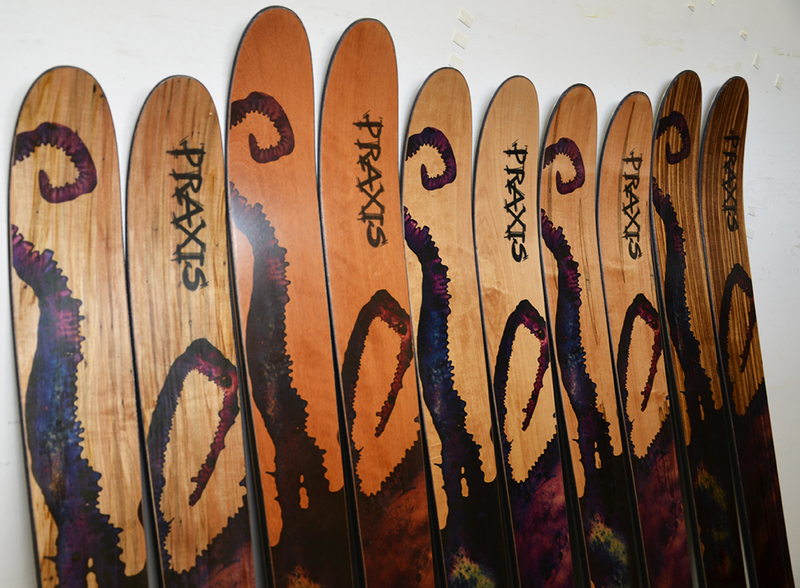 At www.praxisskis.com our custom order process allows you to adjust the flex of the skis, width of the skis, choose from several available core options, a variety of build ingredients, wood veneer tops, graphic options, base options, and more. All of this comes together to be a unique custom ski made to order for you personally. No skier is the same so why should skis be built to only one specification? Maybe that mass produced corporate ski made in China happens to be right for you, or maybe we can make you a pair with a better fit. If you are planning to sign up for a spot on the Freeride World Tour and huck 50 foot cliffs you might want to talk to us. We can help. If you are trying to make that perfect touring ski, eager to find that perfect balance for weight and performance, we can help. From intermediates looking to step up their game to experts looking for a better experience at the resort, our custom ski options can help you improve your skiing experience. Its ski construction not rocket science! The soul and culture that has always been present in skiing is now more powerful and comes alive on your custom skis. When I started building skis, I studied surfing. Not because I was a surfer, but because I related what was going on in the surf culture to what was developing in the ski industry. The personal relationships and conversations between the shaper and the rider are important. The community is strong in both sports, reliant on each other to persevere over the elements. Understanding how the basics in design, shape, size, rocker, sidecut, flex, core and construction are going to make the ski a better fit. These aspects have helped the skier and the sport to progress to new levels. With all that is great about custom skis there is still something to be said about the good old tried and true. For most skiers going after a full custom ski shape is too overwhelming, expensive and not necessary. For others, they want to see a ski that has proven itself. For instance, the GPO, a world conquering freeride beast. Now that’s something you can get behind. So we’ve found that modifying the tried and true shapes to fit a skier’s ability, weight, style, and preferences can be a great thing. These are basic and most of the time obvious adjustments to a standard ski, that are going to make the ski perform better for the unique person planning to descend sketchy, steep and slippery mountains on it. Maybe you want to make one of our popular ski models such as the Protest friendlier for powder touring. If you’re planning to put a light tech binding on them and milk fresh powder turns day after day in the backcountry, why not lighten up the ride with a UL core and enjoy the tour up and down the mountain?! 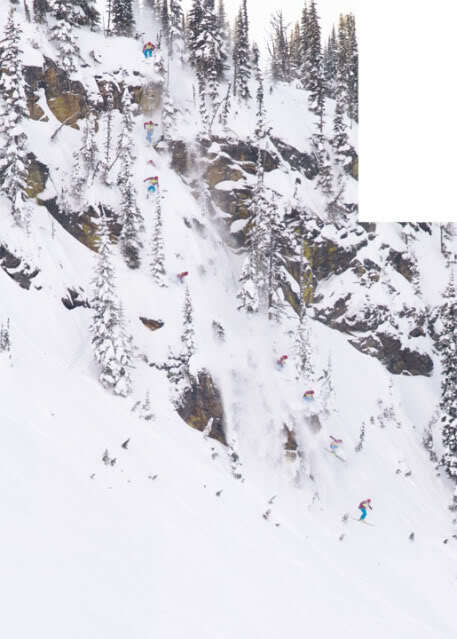 Or maybe your jumping big cliffs into deep powder and hoping to stick the landing and straight line out…you are probably going to want a ski with a stiffer flex and bomber construction. These simple adjustments are part of our custom build process and allow our standard designs to be modified to better fit your needs. So do you need a PHD in ski theory and design to make your next pair of custom skis? NO. We are here to help in the process and with a few conversations and simple questions we can detail the best options for you. The basic info such as height, weight and ability tell us a lot. Next we will look at what you want from the ski. Are you filling out the quiver and adding the fat powder ski or are you looking for an all mountain ski that you can use every day? Then we will want to consider the resorts and conditions that you typically ski. Maybe chat a little about the areas on the mountain that you seek out. Generally when I’m fitting a ski to a skier the standard edition ski that we have sitting on the shelf is not my first choice. You’ll hear me say, “Well, I really like this ski for you but its way too stiff and heavy for what you want”. Or “this is a good shape for what you want from the ski, but we should build it out with an ultra light carbon core to save weight since you will only be touring on it”. However, on occasion the one we have in stock and sitting on the shelf is the perfect fit, well if you like the graphic. As you can see there are a lot of benefits from having your skis made custom by someone you trust. It’s not rocket science but it’s not easy. 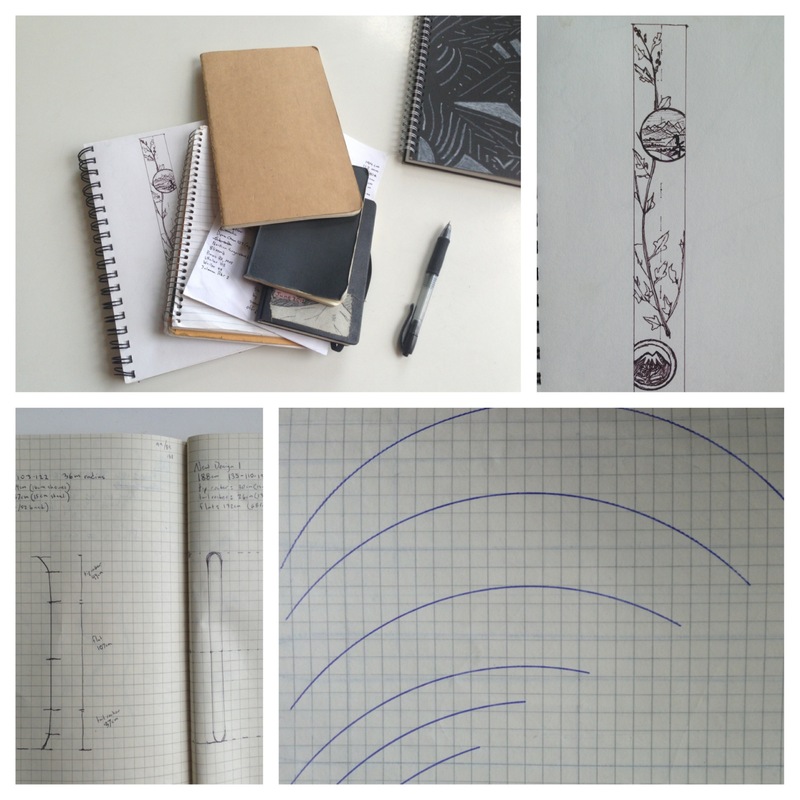 Our unique process is a combination of engineering and art. 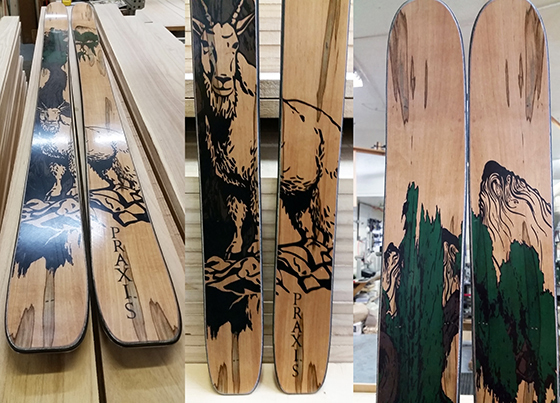 We understand that your skis are the paintbrush that you use to carve your art into the mountains. Skiing takes you places that you never dreamed possible. Dropping in you are flirting on the edge of existence in a surreal calmness, which is impossible to explain to someone that hasn’t experienced it. We understand. And having something that you trust on your feet is essential, we thank you for putting your trust in Praxis Handcrafted Custom Skis! Proudly made in the USA. It is with great excitement, anticipation and stoke that we at Praxis Skis announce my new pro model ski, the Quixote. The Quixote introduces a fresh concept in ski design, something we’re calling offset taper. Simply put, there is a ‘left’ and a ‘right’ ski, each having a tip and tail outline designed to be used on a specific foot. When I joined up with Praxis Skis in 2007, it was because Praxis was one of the only brands making fat, rockered skis, as well as experimenting with unconventional sidecut profiles. (Not to mention they were bombproof skis made by real skiers - as they still are today.) We’ve continued the legacy of progressive design and craftsmanship in the decade since with skis like the Concept and the Protest. And now, we proudly bring you the Quixote. We built this ski because we think this design will improve skiing for skiers of all abilities, in all conditions. Looking at the biomechanics of a skier’s body, along with the forces applied to skis while skiing, it seems obvious that we should have left- and right-specific skis. When we go skiing, whether its steep Alaskan powder or easy groomers at the ski area, we are not skiing on railroad tracks, as traditional ski design may have us believe. We’re making a variety of turn shapes, carving and sliding and constantly adjusting speed and direction. The Quixote’s design acknowledges and accounts for this. Its been years since Praxis Skis owner Keith O’Meara and I started discussing building a ski like this. Asymmetric designs are definitely not a new idea in the history of ski (and snowboard) design, and there are many, many ways that it could be done. We finally settled on the offset taper concept behind the Quixote more than a year ago, and Keith and the guys at the factory started building prototypes. Testing was really exciting – it felt immediately like the concept was going to be a breakthrough, but a lot of tweaking and adjustments were left to be integrated. So we kept thinking, testing and adjusting. At some point last year, I saw the product description for the new ski from K2, the Marksman. I haven’t tried them yet, but it appears that they’ve come independently to the same design principle -- tip and tail shapes specific to a left and right ski. Part of me was pretty bummed – we’d poured a lot of passion and energy into the ski, and a big brand like K2 was dropping a similar idea right at the same time. On the other hand, it felt vindicating that we’re not just pursuing a crazy prototype design -- a big brand thinks something like this is going to work really well, too. In the end, no idea is original. We aren’t doing anything truly new at Praxis with the Quixote and our other offerings; we’re just building on our own experience, as well as everyone else who has come before us. I recently heard a quote about filmmaking. It basically said you never really “finish” a film; you work on with your heart and soul until you can simply do no more, and then you abandon it. Ski design feels much the same to me. Keith and I could send a thousand more emails, Praxis could build a dozen more prototypes, my artist Ryan Smith could continue to tweak the art, but if we did that we’d never release the ski! Not sure if this ski has reached perfection but its damn good, and its time we release it. I’m looking forward to skiing it in the coming seasons and seeing where it takes me next. I hope you’ll come with me. 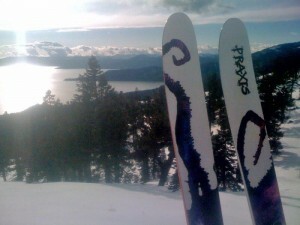 Visit us at www.praxisskis.com and check out the Special Edition Quixote. NEW!! Introducing the Praxis EXP. The EXP found its way into the Praxis Skis line up in response to a request from our Praxis dealer Besseggen Fjellsport in Vågå, where skiing has transcended beyond sport and has been engrained into their culture for centuries more than just lifestyle, truly a way of life. 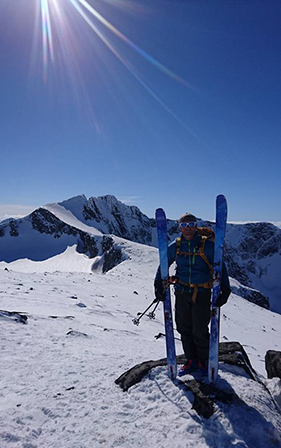 The skiers exploring the Haute Route Norge came to Praxis with a request for a smaller underfoot, fun, lightweight, easy-to-ski expedition style ski for their remote terrain. This amazing ski route traverses across remote terrain in Norway. The Haute Route Norge is a five day randonée ski tour in the heart of the Jotunheimen National Park. The route goes over eight glaciers and seven 2000-metre summits, including Glittertind and Galdhøpiggen. Considering the vertical and distance of travel, a smaller freeride mountaineer class ski was in order. After lengthy deliberation and many conversations back and forth, the design was finally put into place and prototypes were made to be tested- the 183cm EXP 119-88-102. The ski has a longer sidecut length with a subtle tip rocker and relaxed upturn, and offers a flatter tail with pin-tail style taper. One of the major design elements that you will notice in the EXP is the amount of taper from tip to tail. In other words, the tail is 17 mm narrower than the tip. Why? This being an expedition class ski we wanted a design that offered the option for an easy quick turn across a steep fall line. A ski that wants to turn with ease. Though the 88 millimeter underfoot is narrow by Praxis standards, its purpose demands the ski to have some float and balance well in powder, and manage other variable off piste backcountry conditions. The EXP has been engineered for optimal float and balance in these conditions. The broad and respectively fatter tip allows the skier to drive turns and ski with power, while its counterpart, the flat tail with notable taper allows for the power of a flatter tail on hard snow and gives the ski an element of forgiveness and ability to smear when sinking into soft snow, powder or variable wind affected sastrugi. So the design and reasoning was put into place. The ski was shaped and the prototypes were made. With the snow melting and winter coming to an end testing needed to be done. Prototypes were boxed up and shipped out to be tested on the proposed final destination of the Haute Route Norge. With two remaining prototypes sitting at the factory, I find myself in a familiar situation... You would think after 10 years and a countless number of new ski designs that one would settle down and lose that kid at Christmas feeling of anticipation and overwhelming desire to just drop everything and go skiing. But unfortunately this time it was going to be a day or two before these skis made it out for testing. Weather and work was not in my favor. As I sat at my desk updating the website the skis leaned distractingly against the wall to my side. 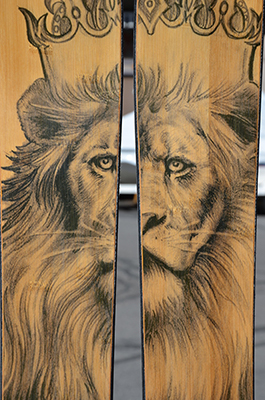 The lion in the graphic sat staring at me and I couldn't help but constantly stare back and examine the grain on the curly ash veneer top... Wow those skis look sick... I can't wait to try them. The reality was these two orphaned prototypes were left behind for a reason. They were not the skis that they were intended to be. With every new shape and design comes some testing and these were the test skis. And testing was the theme of the season so we did some testing when we built these skis. Extra camber - yup! Too stiff - woops! Umm what to do with these skis? Knowing we had designed the skis for long big mountain style ski tours my initial plan was to mount them up with dynafits and head to the Southern Sierra for a long weekend of climbing around on 14,000' peaks. Skiing a mix of stale north facing winter snow, ice, and spring corn with long descents of 6000' or more you can expect to see a range of snow conditions. The skis remained leaning against the wall in my office awaiting a decision on what exactly they would see for a binding and what their first expedition would be. The weather makes the decision and the Southern Sierra was not going to allow us access in the coming days. A lightweight Salomon resort binding would be mounted up and the skis would be tested for the first time on the groomer at Squaw Valley. In the end this made more sense, giving more opportunity to test in a variety of terrain. It can be difficult to get a feel for a ski when only using it for a single descent on variable backcountry terrain. But also the skis being a #4 flex and having extra camber seemed very fitting for carving around skied out resort snow and groomers. I looked forward to making the first turns in the morning on this new shape, and reflecting on the design, I started to realize this could likely be more than a big mountain touring ski, depending on the specifics of the build. I'm not the one that shows up at the resort early to carve on fresh corduroy. Honestly I can't even tell you the name of most of the groomed runs at my local resort. But today was different. Off piste conditions were ok but not begging to be skied. So I found myself carving fast and looking for the fastest steepest groomers, kicking off the top of the lift anxious to get the skis up to speed and lay them on edge for another test. I noted the fact that the 15 mm of taper was also just as effective on the groomer for powerful quick carving. The skis felt stable and responsive and I felt good about the new design. As the day progressed, I moved off piste to a variable new snow, old wet snow and bumped out surface. Not easy to ski and not the snow conditions that would allow for our typical freeride shenanigans of dropping cliffs and straight lining. Today was about control and precision, staying on top of your game and the changing snow conditions. The EXP tails allow for me to make quick turns and release the tails when needed. The tips allowed for me to plow into the crud and drive the ski. Wow. This ski is more than just a slim underfoot mountaineering ski. So the EXP was born. And depending on how you build it I feel this could be a great friendly resort freeride carver as well as true to its design and name.... a great ski for you next expedition.. Grab your pair today and click here to make your plans to travel on the HØGRUTA Haute Route Norge. Besseggen Fjellsport will gladly help you organizing the Høgruta skitour for 2017, and offer you exclusively the combination of local guides and professional guides, to provide you a safe, challenging and exotic ski trip! Reporter Austyn Harrington caught up with Keith and Kevin O'Meara recently at the Praxis Skis headquarters in Incline Village to get the lowdown on Praxis Skis and the upcoming annual Custom Pre Order Sale. Watch the video! Get ready for our annual custom pre order sale starting March 30th. New for this year we will now be offering the option to have our graphics stained onto a wood veneer top skin. Several species of wood veneers will be available. Each slice of veneer exposes a unique grain offering a one of a kind look that cannot be reproduced. Pair one of these wood veneers with our expansive graphic library and incorporate mother nature into the artwork on your next pair of skis. These digitally stained wood veneer tops are not only pieces of artwork, they have proven to be durable and functional additions to the skis integrity, offering a lighter and livelier ride. 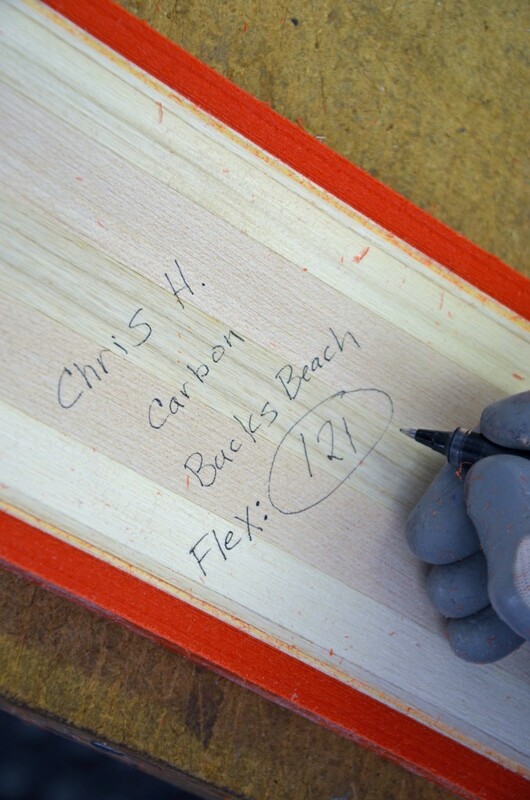 Shave up to 1/2 lb off the weight on a pair of skis by utilizing a wood veneer top skin. Here is a look at some of the skis we recently built with this new custom option. I stood at the Col de Gentianes of Verbier, Switzerland and watched the orange sunlight retreat up the surrounding peaks. Among them, the Bec des Rosses, the venue for the final stop of the 2013 Freeride World Tour, where I had just won the overall world title. A river of thoughts was rushing through my head. Ten years of freeride competition filled with adventure and travel and loss and victory constituted my path up to this moment and a parade of voices, friends’ faces, and mountains flashed through my mind. In one hand I held the overall champion trophy that I had just been awarded. On the other hand, the skis that I rode at every event of the year: My pro model, the Praxis GPO. The story that Praxis Skis has played in my career as a skier cannot be underestimated. Since I started riding their Powder Boards in 2007, they’ve been a steadfast source of support and innovation for me as well as the core group of skiers who support their small brand. Praxis is a puzzle piece that doesn’t always fit in to the makeup of the ski industry. For example, as an athlete it has been difficult to secure sponsorship from binding or boot sponsors without committing to a particular manufacturer’s ski line as well. But I’ve always believed that having access to the innovation and quality that a small brand like Praxis offers is well worth giving up a the visibility and contracts that can come with the bigger brands. 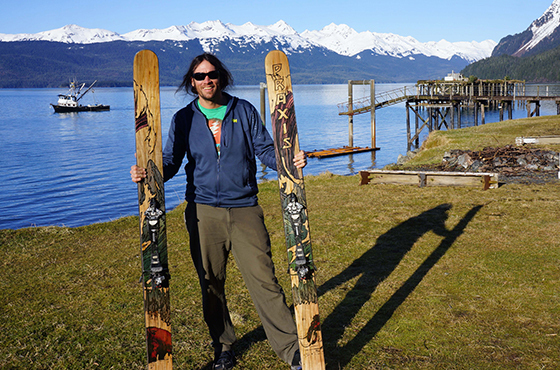 That’s why it was extremely gratifying to win the 2013 FWT and show people that these skier-crafted skis are not just based on some lofty ideals, but that they really are some of the best performing skis out there. It is important to mention here that Praxis Skis owner Keith O’Meara would never claim that his small brand is superior for any reason other than the quality of the product it is producing. He holds no beliefs as to the morals behind an Us vs. Them, David and Goliath narrative that pits Praxis against the corporate ski manufacturers. The foundation of Praxis Skis is and always has been craftsmanship and innovation. I’ve been working with Keith on different ski concepts since I first started to ride for Praxis, testing virtually all the ski models in the line and visiting the factory a couple times a year to see what they had cooking. Keith has been willing to work on whatever loony idea I’ve thrown his way, and for a while I was focused on getting familiar with as wide of a quiver of designs, traditional or bizarre, as possible. When I won the Freeskiing World Tour in 2011 I used five different skis in as many competitions, including my first pro model, the Protest. But for 2013 I felt the urge for a totally different approach. Knowing I wanted to really focus on the first year of the unified Freeride World Tour, instead of using several different skis I wanted to have one super consistent ride I could count on the whole year. That was the basis we started with and we sent ideas back and forth over email for months before I finally got down to the Praxis factory in Tahoe in October of 2012. There I was able to hold in my hands all of the past ski shapes and rocker profiles Praxis had put out and compare that to the computer models Keith had assembled according to my concepts. In this environment everything fell into place and we put finishing touches on the shape, rocker and flex in just a couple of days. The crew started building it before I even left, and I had the prototype in my hands a few days after I returned home to Seattle. The GPO, or Giant Pacific Octopus, was born, so named for the deep-sea creature that lives in the waters of the Puget Sound visible from my apartment, with its color-changing ability and astounding intelligence. The original octopus artwork is from a friend in my neighborhood, Ryan Smith. The first few days on the ski in December at Crystal Mountain, Washington were really exciting. I normally ride Look Pivot 18s, but I mounted that first pair with a Marker Schizo binding so I could slide my center-point back and forth a little bit and find my preferred boot center on the ski. It felt promising right from the first run, and then it was just a matter of waiting for better coverage on the mountains to push the ski farther and farther. It seemed competition-ready, so I took it to the first FWT event of the year at Revelstoke,BC and won with what was maybe my best competition run ever. I sometimes joke that even with five events left on the tour, I won the 2013 Freeride World Tour right then in Canada, such was the confidence I felt being able to compete on a ski of my own making. And if I had a poor showing, Praxis newcomer Lars Chickering-Ayers was there to represent, bringing his GPO to a first place in finish in Kirkwood. When the FWT season wrapped up in Verbier, my two 1st place finishes (in Revelstoke and Chamonix) and follow-up top ten results were enough to secure me the overall championship. It is definitely meaningful that I took the title skiing on the GPO, but more so for the philosophy of Praxis Skis than for the GPO itself. I think the GPO was the best ski for the moment in time that it was used, and for the skier who was using it. 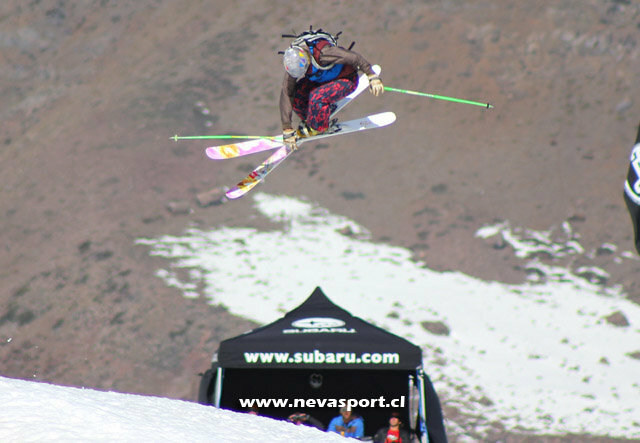 I look forward to skiing the GPO this summer in Chile, and using what I’ve learned from skiing it to continue conceptualizing and refining the best possible ride. The legendary Extreme Verbier is just around the corner and no one is in a better position to take home the overall top spot than Praxis’ own Drew Tabke. With two first place finishes, amongst other consistent results, Mr. Tabke is primed to take the tour title. 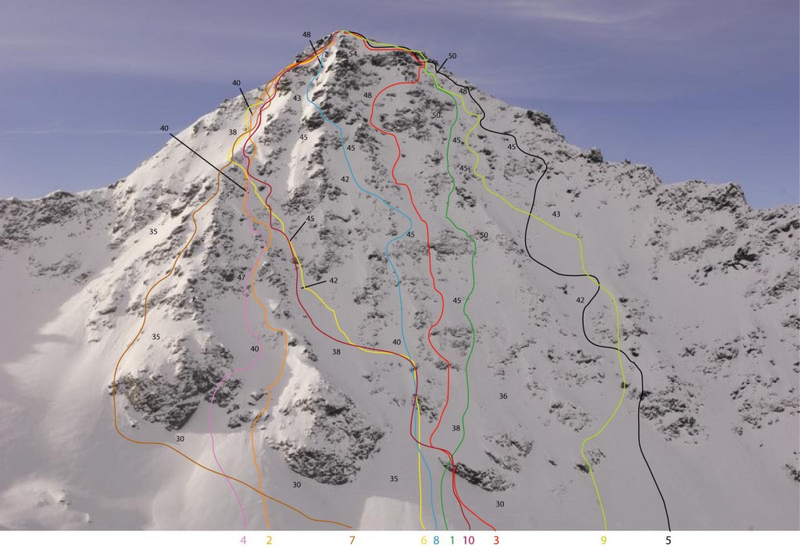 However, as Drew certainly knows, the Verbier venue, which is the last stop on the tour and considered one of the most difficult faces in the world and is not one to take lightly (See photo right). The Bec Des Rosses, which is the name of the peak where the event will take place, looks like an impossible mountain to descend on skis; ice axes, crampons, and ropes would be required for the average person to even consider hanging out on this rock-riddled face. However, these athletes are absolutely nothing like the rest of us. They are well-honed, mountain-slaying, winter-assaulting ninjas who thrive in this sort of overwhelming environment. Master Tabke’s weapon of choice this year has been the much talked about GPO. The Great Pacific Octopus allows Drew to eliminate the number of skis he has to choose from when weather conditions don’t cooperate; a true one-ski quiver for samurais. Luckily for every one of us that has yet to achieve samurai status the GPO (with your very own flex pattern and top sheet choice) will be available for public consumption along with all of our other 2014 skis sometime in the very near future. Keep a steady eye on Praxisskis.com for some exciting things to come! The Extreme Verbier competition has been rescheduled to to begin on Friday, the 22nd. So set you alarm clocks now and watch the live webcast over at www.freerideworldtour.com. Get it Drew!!! The fourth stop of the 2013 FWT is about to kick off in Kirkwood, California. Mr. Tabke is sitting pretty in first place with a couple of hungry Europeans nipping at the tails of his new pro-model, The GPO. 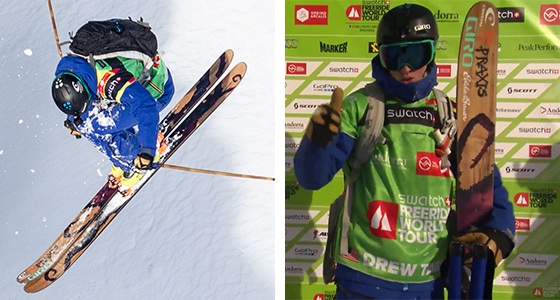 Drew has taken his newly-released-to-the-public ski and completely dominated the early part of the tour season. However, even Drew understands the rarity of three first place finishes in one season with an enormous field of talented and determined skiers waiting to take his yellow jersey. The Kirkwood stop serves as redemption for other Praxis Team riders who have proven their affinity for the venue in past years. Mr. Sean Collin sat on Kirkwood’s podium last year and Mr. Kevin O’meara the previous year. Hell, Mr. Lars Chickering-Ayers won the whole damn tour a few years back, so we all know he’s game and incredibly capable. Unfortunately, the current snow conditions around the Tahoe region leave quite a bit to be desired, and Kirkwood isn’t necessarily an exception. However, Kirkwood’s infamous Cirque is a permanently closed zone that only opens for the tour, so competitors should have fairly good conditions. The venue’s features tend toward North American style of riding, favoring technical skiing at the top with playful zones in the lower sections, allowing skiers to show their freestyle abilities. Overall, Kirkwood is going to be an incredible exposition, party, and competition. And since it is the only stop in the good ol’ US-of-A, you should probably stop by and witness just how hard all the athletes throw down! To Lars, Sean, Kevin and Drew, ski fast, be safe and have fun! 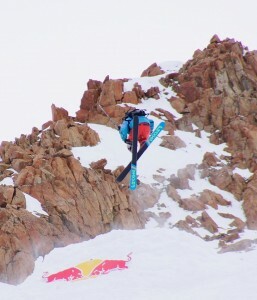 Tune into Freerideworldtour.com on Wednesday for a live feed of the competition. Winter is just around the corner and over here at Praxis Skis we could not be more prepared. While all of our 2013 Skis are in stock and ready to ship, what we are most stoked about is how well the summer’s custom pre-order sale went. After a few months of collecting orders, Praxis set out to build and deliver on our first ever made-to-order production run, offering a unique ski buying experience to our customers. We didn’t just make a standard, cookie-cutter-mass-produced ski, we made an incredible ski and gave customers the option to choose from a large library of graphic choices, and the option to dial in the flex specifically to fit the skier. These options did not cost any more money and we were happy to be able to make skis that would better fit our customers. Additionally, we offered upgrade options to every order that included a carbon fiber layup option, beautiful wood veneer topskins, or even customer-submitted art that made for a very personalized top-sheet. The customization option has always been the goal here at Praxis Skis. We want to make specific skis for a specific skier. Its always great to see a name on the cores we build, not just a number. Its all about the builders and designers conversing directly with the customer to create more than a ski. First, we consider the basic details of height, weight, and skiing ability and factor in specifically what the customer is looking for from the ski. Second, we determine which one of our 14 highly tested and proven models is going to be the best option. And third, we further dial that ski model in to better fit the individual customer, both physically and personally. Building custom skis isn’t easy and as you have noticed from other companies that have these options it is typically very expensive. At Praxis we are not trying to design a totally custom shape and ski for each customer. That would be very difficult and probably not that great of a ski. What we are doing is more like what a boot fitter does with your ski boots. We are taking a tested and proven shape and design and adjusting the details of that platform to better fit the individual skier. After many years of handcrafting skis and developing a formula to pull off this type of program we decided to go for it with our 2013 lineup. We didn’t want to just make it happen, but we wanted to make it happen in the short timeframe we had and also make it cost effective, thus hoping to be one of the best values available on the ski market! Well, the custom pre-orders are all finished, many have shipped and the rest are going out the door, and on time at that! What, you didn’t think we could do it? Honestly, we weren’t necessarily sure either but after some major tweaks to the factory and some very dedicated skier craftsmen we made all the deadlines of production numero one with relative ease…a huge thanks to all those who bought our first attempt at made-to-order custom boards! But even more important than filling these orders on time in the fact that we created skis that we are proud of and were able to fill these orders to spec without a problem. The quality and precision of the skis surpassed our expectations, and along with our ability to dial in the flex and ingredient combinations in a successful manner, we’re confident that the Praxis Skis you bought, or are about to buy, will be the best boards you’ll ever ride. At Praxis Skis our goals are simple; provide a higher quality, skier-crafted product, use better materials, customize it to fit, and offer it for nearly a third of the money that our competitors are charging! Yeah, we’re pretty excited about it, too! Anyhow, tell your friends to get in on round numero two. We plan to fire up the presses again on October 15th for this year’s second made-to-order production run. All of our models are available for custom made-to-order processing. We are able to once again offer this customization for no additional charge! And with confidence we will deliver before the ski season kicks off. What’s even better? For the month of October only, we’ve upgraded all those coupon codes to be worth 20% off, so the prices are pretty much the same as our low summer offering. Basically, we really really want to make you a custom pair of skis for no extra charge but we also really really need to know what you want by October 15th so that we can ensure timely delivery. 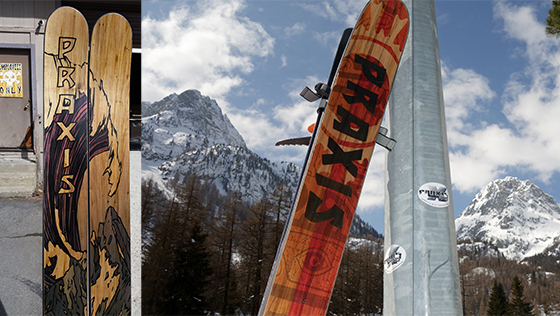 The snow is coming and now is the time to order your Praxis Custom Ski! After October 15th we will have to start charging more for custom made-to-order skis….as we don’t want mold set-ups and time consuming custom “one-off” production cutting into our powder skiing time! And you want your skis before those lifts start turning! So order your skis today and use the coupon code PRAXIS to save 20%!!! Delivery on custom orders from production run 2 will start November 1st and all orders will be filled by December 7th. Or maybe you’re thinking like we are and know that its going to dump on Halloween and be the biggest winter in years! 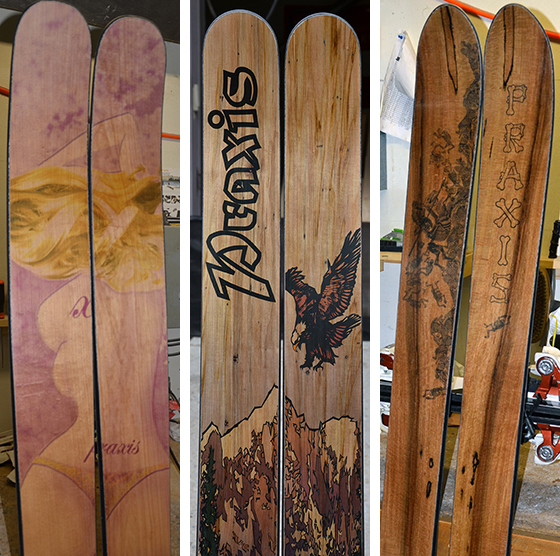 Its not often that Praxis Skis has all of our models on the shelf ready to ship, and we have a VERY limited supply. If you prefer to take advantage of our 20% off prices and grab one of the IN STOCK Praxis Standard Edition skis, we will ship it right out to you (I heard it was going to snow next week!!!). P.S. All this stuff is proudly produced by a group of incredibly dedicated skiers who work right here in the good ol’ USofA. We all thank you very much for your support. As Drew Tabke puts it, “It’s going to be a close competition between Sam Smoothy and I in Verbier.” After a dominating win in Fiberbrunn, Austria’s venue, Drew currently sits in second overall, just behind New Zealand’s Sam Smoothy. Tabke took the top spot by mixing “high-level big mountain skiing with smooth freestyle tricks in his typical trademark style.” By spinning a massive 360 followed by a smooth backflip, Drew truly defines the new direction that big mountain skiing is going. The Verbier stop of the FWT is the crowning jewel of the entire year and with incredible momentum going into the final stop, Drew is sitting in prime position to take the title. Praxis, Utah, Washington, and hell, even Hawaii is rooting for Drew! Kill it buddy! 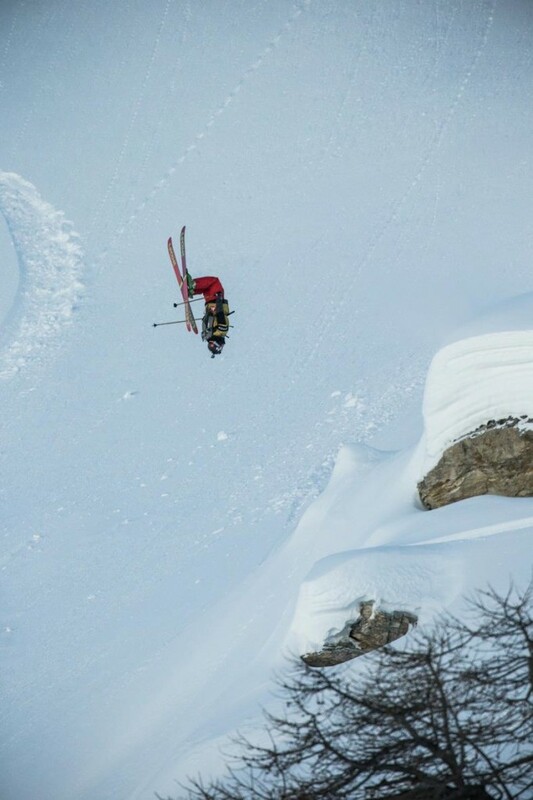 And, in other Praxis Team news, the only other skier fortunate enough to wave the Praxis flag, Kevin O’Meara, is sitting pretty in 6th place on the Freeskiing World Tour. As a small, independent ski manufacturer we are proud to have guys like Kevin and Drew representing Praxis on an international level. Not only are they two of the most incredible skiers in the world, but both guys bring a humble personality and a passion for progressive skiing that is a breath of fresh air in today’s ski industry. Thanks fellas and keep doing what you’re doing! World Tour. Kevin, like Drew, has an amazing ability to throw huge freestyle tricks in technical, big mountain terrain. Kevin’s next competition comes next weekend at Snowbird. Typically, during a normal North American Winter the Snowbird stop of the FWT takes place last. However, due to below average snowfall a number of events on this side of the pond have been postponed or canceled all together. After the Bird, look out for Kevin to be on the Kirkwood podium again in the early days of April! Stay tuned for the live stream that is normally provided at freeskiingworldtour.com…it should be quite a show! 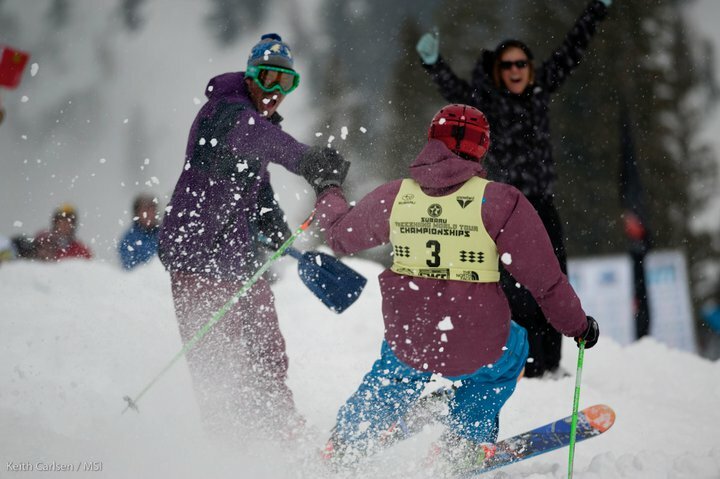 The 2011 season of the Freeskiing World Tour was a powder-chasing roadtrip. No year in the last six comes close to the quality of skiing the tour came upon at each stop. Of the six events, we skied fresh snow on finals day in five of them. But regardless of snowfall, conditions in the competition venue can change right up till you drop in. Even during your run. So all competitors do something a little different when it comes to choosing their skis. Some ski one pair all year regardless of snow conditions or the venue. Some have a ski for hard snow and a ski for deeper snow. I’ve tried lots of different strategies and combinations of skis over the years and I’m sure I will never be totally satisfied. I’m lucky enough to be supported by Praxis Skis, an amazing company specializing in hand-made freeskiing boards, and those guys make all of this possible. Here are the skis I used this year when I won the world title. Backcountry 190cm. (Specs) Marker Duke binding. 4th place and 3rd place. I chose to bring this ski to Chile for three months last summer. I wouldn’t normally compete on a Marker Duke binding but I was limited in how much gear I could bring. The skiing in the central Andes can be inconsistent – one day you’ll have deep powder under the sun, and the next the fearsome wind will show up and blow all the snow into the pampas. It hadn’t snowed for weeks up to the El Colorado comp, but the snow was nice and spring-like and the Backcountry handled the transition between the chattery spots and slush easily. It worked great in Las Leñas too, where it again hadn’t snowed for weeks until a few inches dropped the night before the comp. The wind was favorable and the venue was covered with consistent wind-deposited powder with the occasional scoured, icy patch. The Backcountry was the right again. Chilean Champs on Santa Teresa. ¡Chi chi chi, le le le, VIVA CHILE! Concept 187cm. (Specs) Rossignol FKS 18 binding. 2nd place. The first time I skied the Concept at Crystal Mountain, WA, I knew I was hooked. The conditions that day were a foot of fresh powder over an ice crust from earlier in the week. The Concept made fun, fast, slashy turns in the powder and then hooked up automatically when I’d bottom out on the rain crust. It seemed like one of the most versatile skis I’d ever been on. I took it to Revelstoke along with my Protests in case it dumped. Dump it did, but I elected to ski the Concept on day 1 of the competition anyway. The line I chose went through some really tight trees in two sections and I wanted the most nimble, technical performance I could have through that type of terrain. I also found a small jump to 360, and with the Concept it was easy to get the trick around. Day 2 I stuck with the Concepts but I obsessed over the decision the night before in the hotel room. We were taking a helicopter up to Mackenzie Face and there was a chance for it to be really awesome powder conditions in which case I would ski the Protest. But there was a lot of avalanche activity around the mountains in the preceding days and some reports of variable snow despite the huge snowfall so I stuck with what the Concept. It was a good call as helicopter bombing, ski cutting, and hand charges thrown by ski patrol brought down almost all of the fresh leaving a punchy, dangerous expanse of unpredictable snow. The versatile Concept took care of business. Concept 187cm (w/ new molding). FKS 18. 14th place. Ahh, Crested Butte. It was my first time to the Extremes, but I knew ahead of time that jump-turning would be a prerequisite, so I again showed up on a Concept. It was a new pair as the one I had originally was a beta version and a serious blem – having shifted in the ski press one ski had come out 2mm wider than the other. The new pair also had the new multiple camber molding. Day 1 was tough, moguled, rocky, and nasty. Perfect Concept terrain. And lo and behold, it snowed. A lot. I swapped my bindings over to the Protest the night before the finals on day 2 and got face shots, to the dome, in my comp run. It was likely the deepest snow I’d skied in a comp and was stoked to have the big boards. Protest 196cm. (Specs) FKS 18. 5th place. Kirkwood is tricky every year in the spring. It seems like every time I’m there it snows three feet and then the sun comes out. Sometimes it gets too warm and bakes the snow too much, leaving a chunky, manky mess. Sometimes all the snow avalanches, making other problems. I had the RX with me in case of variable snow, but this year the conditions were unreal. Consistent powder covered the entire Cirque, none of it slid during control work, and though the sun was out it didn’t get too hot. I skied the Protest both days and damn did that feel good. RX 189cm. (Specs) FKS 18. 1st place. Overall world title. Snowbird rocks. I love having the last stop of the year in my home mountains. The venues for the Bird tend to get more traffic before the comp and during inspection than any of the others so although I was hoping for a miracle dump to ski the Protests, I knew I’d probably use the RX. I had moved to the RX from the Concept as my non-powder ski. It is a little bit longer and softer so it makes big, high-speed GS turns down wide-open slopes and chopped up snow which was what I thought would be best on venues like Silver Fox and North Baldy at Snowbird. Conditions were again laughably good and both venues filled in with amazing wind-deposit powder in the days before the event. For both days, the masses of competitors moved through for their inspections and runs and the ski performed perfectly in the soft crud left behind. And that concluded the competition season. With spring upon us most skiers I know are getting ready for some of their biggest trips of the year. Here in Washington, the same is true. I’ll be going on a 10-day trip in the North Cascades with a new Protest under my feet. The new Protest has the backcountry as its priority with lighter materials in the core and an updated shape. I am excited about the option to have binding inserts for your specific binding build into the ski, effectively bolting the binding onto the core instead of drilling into it. In my case I’ll have the inserts installed for a Dynafit FT12 binding, for my particular sole length. At first glance the ideas behind the Concept Ski can be easily questioned, so let us explain more about how we created the design that has received so much praise. Let’s start with a little background information; here at Praxis Skis we love our Powder Boards, which are full reverse- sidecut sks, mostly because the driving power of the ski is transferred to the underfoot area of the ski allowing the skier to surf the mountain in a new way but also gain edge hold and maintain the ability to kill speed faster. The combination of power with pivot underfoot and the lack of tip and tail catch or hang ups make the Powder Boards exceptional. However, in wanting to create something different, we decided to kick around the idea of a hybrid reverse sidecut/ regular sidecut ski. The result is a ski with sidecut underfoot while the tip and tail maintain reverse sidecut, or early taper. Recently many ski manufactures have made these types of skis with varying degrees of success but the basic idea is a huge advancement in powder skiing designs. Our ProTest design is an example of a ski that fits into this category, and in our opinion it is one of the better designs offered on the market today. Click here for our Protest specifications.hang ups make the Powder Boards exceptional. However, despite how much we enjoy the Protest, we still wanted to design the hybrid ski with reverse sidecut underfoot. You see, over here at Praxis we love to slip our edges, yes, slarve. But when it came time to draw this “slarvable” ski we were unable to come up with a design we truly liked. That is until this year when it finally clicked! We’re not making a hybrid design, it’s truly something new altogether; what we needed was a 3-point sidecut! Finally, the answer. Many drawings later we had something that made sense and we were off to cut a full-size template on the CNC. After completing the design and making the ski, we were more than excited to put this concept on the snow. The potential performance capabilities of this new idea seemed enormous. A rush to the ski shop, quick stone grind, edge wax, binding mount, a text to a buddy at Squaw about a night skiing pass, and we were on the snow! The culmination of time, brain power, and experimentation had consumed Praxis for weeks, and quite possibly years, and now the time had finally come to really see what these things could do. Night skiing tends to be cold and icy and this night was no exception. 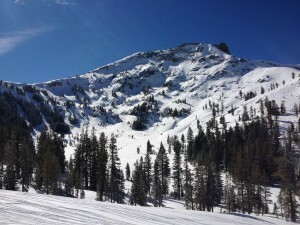 Standing at the top of the MTN run at squaw I knew this would be a good testing ground. Would the ski carve? Or would it just get sketchy on edge? Would it even turn?!?! The excitement to ski it was quickly followed by anxiety and nerves. It’s extremely defeating to spend so much time and effort on a design only to have it perform poorly. Design failures tend to show themselves very quickly but after that first roll of the ankle, even at a slower speed, the ski was put on edge and it carved! Again and again, over and over, edge initiation was simple and easy…test one was a success. Over the next month more testing was done and much was learned. Design modifications were made smiles were created. The concept ski for 2011 was created, and we quickly realized for so many reasons something great was created. Powder Boards and fatter underfoot technology…..
Fatter underfoot technology is a very unique ski design unavailable from any other major ski company. Our Powder Boards, with full reverse sidecut and continuous curve rocker, offer a powder skiing experience unmatched and unattainable by a ski with tradition sidecut. However, don’t be confused into thinking this is some new design concept because skis have been built with fatter underfoot technology for hundreds of years . The reality is the groomer ruined ski designs because the second you go off-piste a ski specifically made for groomed runs will serve you no good. Whereas fatter underfoot technology will serve you far better in the conditions you actually want to be skiing in. It just makes sense, works better, is easier to ski, and makes you ski faster with more control. A ski with traditional sidecut does not offer the correct balance and weight distribution to the skier in soft snow. Instead, the traditional sidecut takes the riders weight and centers it over the skinniest part of the ski. It sinks in this area, the tips and tails being fatter then the underfoot area become weighted and hang up on the snow’s surface. Basically you do not need a big fat tip to make the ski float if your weight is supported underfoot. A traditional sidecut ski will require the skier to weight and unweight the ski in order to make a turn in soft snow, especially noticeable in less than perfect powder conditions. This action uses more energy. The set turn radius that the ski was designed for also works against the skier; requiring the skier to engage the tip in order to make the ski arc a set radius turn. Sounds good but it’s a time consuming act, allows for less ability for a variation of turn radius, making it more difficult to change your line direction on demand, and, again, uses more energy. The powder boards fatter underfoot design provides better weight distribution and a more balanced ride in soft snow. The tips do not have to be fat in order for the ski to surface, instead the riders weight is supported underfoot and this allows for the ski to maneuver and turn in soft snow with an ease most skiers have never experienced. The tail being skinnier then the waist and tip is able to sink and allows for the ski to travel through the snow at the correct angle to stay afloat. The power and initiation point of the ski’s turn is moved from the traditional method of engaging the tip and arcing a turn to feathering the turn and controlling from the center of the ski. You now make turns by allowing the reverse sidecut to “fall” into the turn, meaning you have a variable turn radius. We relate this turn experience to a feeling of having “power steering”. You do not need to take the time to engage a turn, you just do it. You can now change the turn radius by feathering the turn more or less as required. This provides a balance and pivot point that allows for the ski to turn in soft snow like nothing you have experienced before. The continuous curve rocker enhances this experience, helping to keep the ski afloat by directing it to surface at all times. And, with no flat spot, the skier is able to shift weight balance forward or back very quickly allowing for a more precise feeling of control and a better ability to maneuver. Continuous curve rocker combined with reverse sidecut offers the skier an experience of surfing on the snow and will open up opportunities off piste for skiers of any ability. The powder boards have a solid flex patter that is stiff enough for the most aggressive skiers but when combined with the rocker the stiffer flex is not overwhelming for the beginner/intermediate skier. The flex pattern is powder specific and functions to help the ski stay on the surface. The taper that is a result of fatter underfoot technology allows for less deflection when the skier passes through bumps, or chunks of debris that would most definitely deflect a fat tipped ski. Think of it as an arrow or dart that is able to pass through these obstacles with minimal interference. The tip opens up the trail gradually and allows for the weighted fat underfoot portion to pass through, the tail is then able to follow suit without drag, which makes for a faster and smoother means of gliding. Without a doubt, I ski twice as fast on these skis than any other model and have a better feeling of control when skiing at higher speeds. There is no wonder that the classic Powder Boards are still a favorite at the Praxis factory and with all of our prototyping and development of other models I can say that this concept is here to stay. Enjoy the ride.